The Ladies 3 Sunday School class at Calvary recently found a creative way to “be a blessing” to members of our nation’s military. 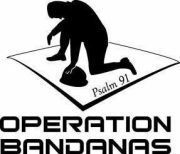 Through an organization called “Operation Bandanas” (which was established by a woman whose husband was a soldier, killed in the line of duty), they packaged 200 bandanas, each of which was imprinted with Psalm 91 and packaged with a personal note of encouragement. The ladies recruited some help for their note-writing from the girls in our Mid-Week children’s ministry, and they did all the packaging in a one-day “bandana blitz” that included pizza, fellowship and lots of fun. The finished packages were then sent to Operation Bandanas, which will distribute them to servicemen and servicewomen overseas. There are so many ways that our God can use us to enrich the lives of others and put His goodness on display. Thanks to the members of Ladies 3 for taking advantage of one such opportunity and sharing a report with us!